Poster Passion is known for our quality custom framing products used when creating the correct frame design for your vintage posters and personal art. Choose the right look for your art and your home. With 4000 corner samples we also have the availability to order almost every additional moulding styles from top manufactures. We honestly believe in taking care of our customers and helping you find the correct framing design that’s exactly right for you. Your moulding choice is only one consideration in framing. To protect your art from sun damage the ‘glazing’ or glass is what protects the artwork from dangerous ultraviolet light. You will be guided in the options of UV conservation glass; reflection control glass; anti reflective glass, Museum 99% UV glass, UV Plexiglas and UV reflection control Plexiglas. At at the top of this list for oversize art you have Optium Museum Acrylite. We recommend archival material. Our specialty is hand wrapped mats that can be created in various colors using linen, silk, suede, satin, and cotton materials. The custom mats allow you to have selections that are oversize and larger than standard sizes. Yes, we also have all of the current style of museum, archival, and buffered paper mats as well. The picture-framing mat is most commonly known for its use as additional decoration to enhance the look of a framed piece, sometimes in conjunction with a fillet or, liners made of wooden moulding with a cloth surface. Vintage European Posters and Collectible Movie Posters and high end reproductions. Photographic art and family photos. We can handle your small, large and jumbo oversize artwork. 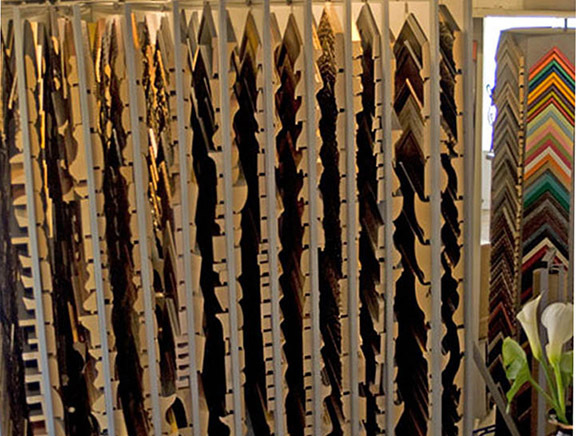 The gallery keeps on file your previous frame orders so that we can duplicate an existing frame.